Don't Feel Like Reading ? Here's A Quick Summary Of The Ryobi Circular Saw Review. The RYOBI circular saw is a very affordable saw that comes with a laser guided beam and a stunning 4700 RPM blade rotation which ensures accurate speedy cuts. The P506 cordless circular saw model has a quick blade release mechanism, a 3 year warranty and a rubberized handle grip. The battery charges very fast and it also comes with a handy saw dust blower. When it comes to cordless circular saws, Ryobi is a name less heard of. The fact that they have spent a long time in analyzing power tool market trends, the manufacturers were leaning on prototypes before releasing their own version of an “ideal” circular saw. Needless to say, Ryobi still has a lot of ground to cover, despite of the release of the Ryobi P506 One+ Lithium Ion 18V 5 ½ model. Ryobi made the P506 One+ cordless circular saw available for the first time in market back in August 2012. 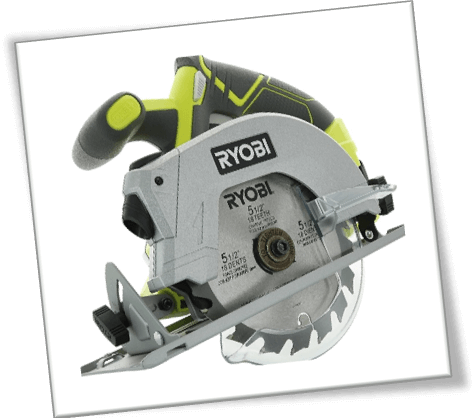 By that comparison, there are several other circular saw products within the same niche that beat the competition such as the Dewalt DCS391B or the SKIL 5280-01 , but Ryobi P506 still has a bit of grit to cover. Right off the top of my head, one of the reasons I can think that anyone would buy this handheld Ryobi circular saw is because of the attractive pricing. Since it is a Power Tool only product, you just get the base model with a state of the art 24 toothed carbide blade. In this context, you are better off with a Ryobi instead of those circular saws that either come with a lame blade or a cheap one such as the Black & Decker BDECS300C and the Porter Cable PCC660B . All thanks to a blazing 4,700 RPM speed, the blade can easily carve through plywood, oak wood and other variants of cutting material within 5 – 6 ½ inch thickness range. I know, the box specifically says Ryobi 5 ½ inch cordless circular saw, but you can get more cutting depth with the right angles and proper maintenance. The saw is not a miracle product – i.e. it’s overall results depend on how you use it, and wherever it is demanded the most. Introduces a beast of a razor motor with 40% increased performance. Limited 3 year official Ryobi parts and tool warranty. 35% increased cutting capacity on one full charge as compared to P501 series. Despite of the above mentioned improvements, Ryobi cordless circular saws product lineup is not made for extensive construction work. The fact that these saws are cheap, kind of sets them back on the priority scale for those workers who wish to take on professional projects. A couple of years ago, cordless circular saws were not that common in the commercial sector. While it is true that they were already available at thousands of retailer shops, woodworkers despised these products because of the whole “cordless thing.” In fact, there are still a lot of people who don't want to use these skill saws because of the absence of a power cord. It reduces their work output due to poor battery performance. In some sense, a lot of upcoming manufacturers are struggling to keep up with robust battery life, but for those who have been in the market for over a decade now, it’s not such a big issue. However, if you are a proud dad who likes to fix things on his own, this Ryobi circular saw is going to be a great companion. Construction work is not easy; it requires a lot of mobility at times – and that too at weird angles where corded tools won’t reach easily. Ideally, a cordless circular saw can assist you on roofs, ladder tops and hard to reach areas where you are limited to a certain step count because of the power cable restriction. Ryobi kept these issues in mind and released not only the P506 model, but a slightly improved P507 model as well. They did a legitimate job in bringing accessibility to construction and wood workers alike. However, the saw is only coupled with a handful of features that make it ideal for entry level users in the market. Although Ryobi P506 One+ cordless circular saw only comes with a classy blade and the base model itself, it is compatible with a long range of power tools and accessories. Take the Square Tool, as a fine example that comes handy for as long as you are considering precise square shaped cuts with this skill saw. On the same note, Square Tools are not compatible with all kinds of circular saws. In some cases, you won’t have any clue about whether they’ll work or not until the last moment. 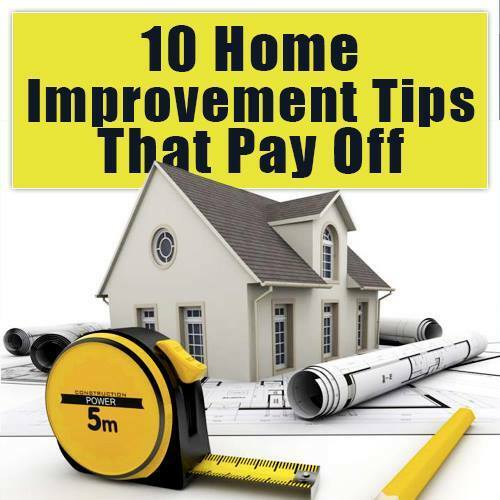 You can, however, mention this in advance to the vendor to make sure that they can issue you a refund in case of an incompatibility or set you off with another replacement part to work with the particular Ryobi circular saw model at home. Ryobi finally installed a small laser beam projector on the P506 One+ head to assist users. A lot of time, the handle of the circular saw tends to block the vision, which is why woodworkers need to look from an overhead angle to see where the blade is actually going. For some reason, the company decided to remove the laser beam from the P507 model. I don't know why they did it, but you can browse around at different forums to investigate on your own. For all I know, the addition of laser beam has been a blessing in disguise for wood cutters – regardless of the scale of the project. It came to me by a bit of a pleasant surprise, but somehow I was able to get 60+ cuts on a full battery charge. The Ryobi P506 didn't shy away from 2 x 12 plank dimensions, not even for one minute. Cutting through them was a breeze, but I had to take a pause after every 10 pieces. The saw seemed to overheat, which hindered my ability to seamlessly go through all the planks in one sitting. This is a mid range circular saw, but it’s compact size is a huge deception. 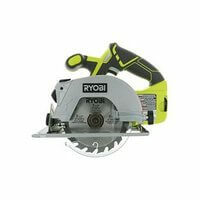 For small scale projects, this RYOBI saw can handle its own where other models within the same class and range may fail. The cuts that I was making were straight and diagonal for a small book shelf. I didn't try bevel cuts, and you might have a totally different experience in that sense. Every now and then, there seemed to be an invisible “hump” that I had to overcome half way down a plank. I consulted with other Ryobi P506 One+ Lithium Ion 18V 5 ½ 4,700 RPM cordless circular saw users on the internet, and they also reported the same thing. It seems that the saw has to be lifted up slightly at the exact moment you feel it going over a hump. The good thing is that there is a very easy blade release mechanism on this skill saw. All it needs is a little push on the blade replacement wrench located on the handle. The saw head will automatically let go of the circular blade at the bottom. Changing blades on these saws can be a hassle – and this “issue” poses an entirely unique challenge to construction workers. However, a bit of practice will set you on good terms with your circular saw regardless of which brand or series it hails from. Fast charging that lasts longer than anticipated. For maximum results, use the circular saw in small intervals. 4,700 RPM blade ensures precise speedy cuts. Top it off with the laser guided beam, you are looking at accurate results that leave the guess work out of the equation. 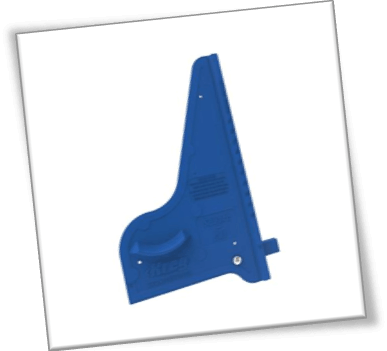 Quick blade release mechanism allows for easy replacement. Overall good ergonomics alongside rubberized handle grip. Saw dust blows away automatically in the opposite direction from the user’s position. Not an ideal circular saw for professionals. 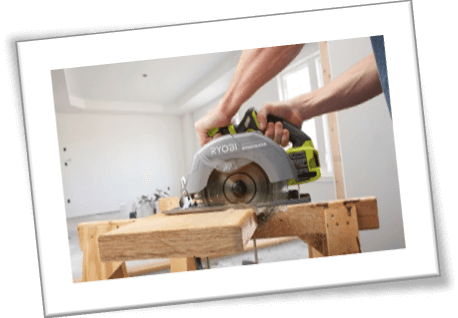 As a matter of fact, pro woodworkers may not even look at the Ryobi P506 One+ Lithium Ion 18V 5 ½ 4,700 RPM circular saw at home depot aisles for that matter. Weak shoe takes a hit on long term durability factor. Reduced battery life due to high RPM blade output. So, is it a ya or nay? I guess if you are considering DIY projects, Ryobi’s entire product lineup is worth checking out. These hand held saws can also render usefulness for beginner’s who are looking to pursue woodworking as a full time career. You can practice a whole lot of angled cuts, bevel cut designs and other things on this saw, or any other saw within the same price range. 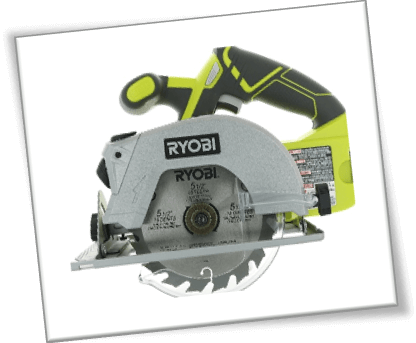 Still not sure if the Ryobi circular saw is right for you? You can compare the best circular saws here or read our complete circular saw tool guide. Hope this can help you make your decision on which saw you should buy.